I like pictures that tell stories, with simplicity & focus – something that probably comes from my background in copywriting & marketing. New assignments and commissions welcomed (incl video editing and copy). the photographs, please get in touch by email or BubbleMail (see link above). ALL RIGHTS RESERVED. The reproduction, publication, modification, transmission or exploitation of any work contained herein for any use, personal or commercial, without prior written permission from Handheld Films is strictly prohibited. 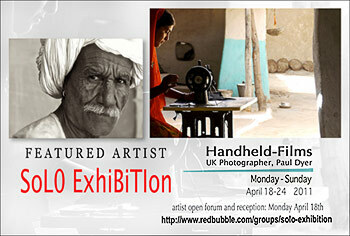 Join me at Handheld Films’ Solo Exhibition, / ‘Handheld Films – From India with Love’ / Hope you can make it – come and say hello! !ART AND PHOTOGRAPHY (1Per Day)!